This manual is composed of several volumes, each containing its own purpose. 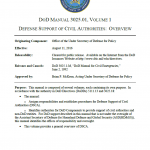 In accordance with the authority in DoD Directives (DoDDs) 5111.13 and 3025.18 the manual assigns responsibilities and establishes procedures for Defense Support of Civil Authorities (DSCA) and identifies authorities for DoD Components to provide support of civil authorities and non-DoD entities. For DoD support described in this manual that is not under the oversight of the Assistant Secretary of Defense for Homeland Defense and Global Security (ASD(HD&GS)), this manual identifies the offices of responsibility and oversight. National and foreign military forces can play a vital role in the response. In natural disasters, many national militaries are designated auxiliary or even primary first responders in-country. If a large-scale disaster exceeds the response capacity of an affected country, the Government may seek assistance from the international community or neighbouring and partner countries. As part of their response, foreign Governments tend to deploy their military forces, especially if these are already deployed in the region. In armed conflicts and complex emergencies, humanitarian and military actors share the same operating space, but not the same mission. They are likely to have very distinct roles and mandates. For the last two fiscal years, the President’s Budget Submissions for the Department of Defense have included purchases of a significant amount of combat equipment, including armored vehicles, helicopters and even artillery, under an obscure section of the FY2008 National Defense Authorization Act (NDAA) for the purposes of “homeland defense missions, domestic emergency responses, and providing military support to civil authorities.” Items purchased under the section include combat vehicles, tanks, helicopters, artillery, mortar systems, missiles, small arms and communications equipment. Justifications for the budget items indicate that many of the purchases are part of routine resupply and maintenance, yet in each case the procurement is cited as being “necessary for use by the active and reserve components of the Armed Forces for homeland defense missions, domestic emergency responses, and providing military support to civil authorities” under section 1815 of the FY2008 NDAA. The Domestic Operational Law (DOPLAW) Handbook for Judge Advocates is a product of the Center for Law and Military Operations (CLAMO). Its content is derived from statutes, Executive Orders and Directives, national policy, DoD Directives, joint publications, service regulations and field manuals, and lessons learned by judge advocates and other practitioners throughout federal and state government. 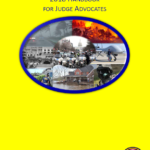 This edition includes a substantial revision of Chapter 3, it incorporates new guidance as set for forth Department of Defense Directive 3025.18, Defense Support of Civil Authorities (DSCA), it provides amplifying information on wildfire response, emergency mutual assistance compacts, the role of the National Guard and Army units such as Army North and Joint Task Force—Civil Support, and it discusses the 2010 Deepwater Horizon oil spill. This report sets forth the statutes, Executive Branch documents, regulations, and Department of Defense (DoD) internal directives that define and govern Military Support to Civil Authorities (MSCA). The policies and responsibilities of the military departments and staff agencies of DoD are reviewed, as they have evolved from the early 1950s to the present. The events of September 11, 2001, have placed the MSCA function in the larger context of homeland security, and documents setting forth homeland security policy as it defines MSCA have been reviewed as well. 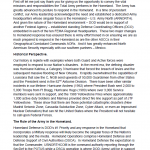 This report also discusses DoD civilian and military responsibility for MSCA, and the states’ position regarding the National Guard’s role in support of civil authorities. Finally, this report evaluates the criteria for providing MSCA, and assesses how DoD compares this function with its warfighting mission. The President is authorized by the Constitution and laws of the United States to employ the Armed Forces of the United States to suppress insurrections, rebellions, and domestic violence under various conditions and circumstances. Planning and preparedness by the Federal Government and the Department of Defense for civil disturbances are important due to the potential severity of the consequences of such events for the Nation and the population. This manual provides preplanning guidance for handling emergency situations, which include the full spectrum from civil disobedience through hostile disturbances to violent acts of terrorism. It discusses the concept of operations in planning for these crisis situations and offers an outline for preparation, execution and resolution of mass disturbances. Air National Guard units will use this manual as guidance. The use of name or mark of any specific manufacturer, commercial product, commodity or service in this publication does not imply endorsement by the Air Force. This regulation prescribes responsibilities, policy, and guidance for the Department of the Army in planning and operations involving the use of Army resources in the control of actual or anticipated civil disturbances. Basic authority is contained in DOD Directive 3025.12, Employment of Military Resources in the Event of Civil Disturbances. These template of the Standing Rules for the Use of Force developed by Army North (ARNORTH) and approved by Army Judge Advocate General (JAG) School for commands to follow. The first two templates apply to forces under federal control. The third template is an example State RUF card for National Guard personnel in a SAD or Title 32 status. 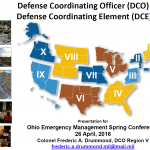 These templates are taken from the “DoD Defense Support to Civil Authorities Handbook” which includes other information relating to military support operations related to civil disturbances. 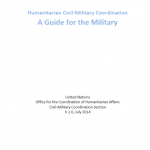 Military units tasked to support civilian authorities during domestic disasters enable rapid and effective disaster relief operations that limit loss of life, mitigate suffering, and curtail further significant property damage. Lessons learned from recent disaster operations, however, highlight inefficiencies where DOD organizations interface with other local, state, and federal government agencies tasked with disaster relief operations. The challenge remains in integrating military and civil capabilities within a disaster stricken operating environment with little intact infrastructure while urgently and efficiently executing relief operations. Critical to effective disaster relief operations is the DOD ability to commence immediate tactical level relief operations nearly simultaneous to the occurring disaster. The Domestic Operational Law (DOPLAW) Handbook for Judge Advocates is a product of the Center for Law and Military Operations (CLAMO). First published in April of 2001, it was the first of its kind. Designed as a resource for operational lawyers involved in domestic support operations, its publication was indeed timely. 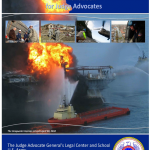 After the events of September 11, 2001, and more recently, Hurricanes Katrina in 2005 and Ike in 2008, the Handbook continued to meet a growing need for an understanding of the legal issues inherent in such operations. As with the original publication of the Handbook, this update would not have been possible without the tireless efforts of countless active, reserve, and National Guard judge advocates who participate in these unique operations on an ongoing basis.